Now would be a great time for me to say something wise about running. About why I love it…or why I sometimes hate it…but really I don’t have many words today. So instead, let me tell you about my run this morning. It wasn’t anything miraculous, nor was it intensely awful…it was just a run. Because runners know that most runs are relatively unremarkable, running is just something we do every day. My cell phone alarm played its obnoxious tune at 7:20. I groaned, but really 7:20 isn’t that early – so I had no good reason not to get up. I brushed my teeth, threw on some pants and a sports bra, and turned on my TV to keep me company through my abs workout. It was on the Cooking Channel, so Molto Mario taught me how to make an Italian soup while I went through my plank and 8-minute abs routine. At 8:00, I headed out the door. The November morning chill went straight through my clothes, reminding me that soon I’ll be winter-style bundling in layers of fleece. I walked to the end of my block as a psyche-up warm-up, then acquiesced to the inevitable and picked up my feet to run. I was ipod-less this morning (I forgot to charge it), so I was all kinds of alone with my thoughts. 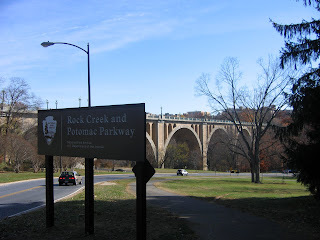 I ran through Rock Creek Park, then up to Massachussettes Avenue and back to Dupont. My total run was just 26 minutes (3.4 miles), a duration I would have scoffed at a year ago, but is now a reasonable run for me. I finished my run and walked up and down my block to cool down, marching a bit to stretch out my legs and glutes and doing 20 tin soldier dynamic stretches for my hamstrings. And that was my run this morning. Nothing special, nothing crazy, just a normal morning run. If you can’t see the map below, click here.